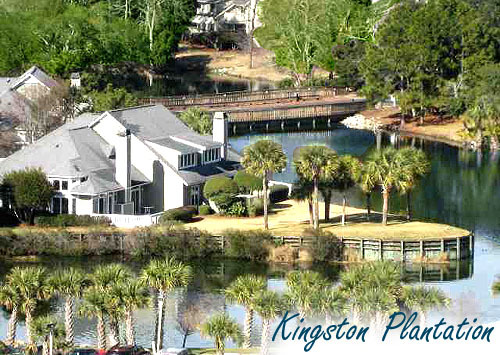 The acclaimed Kingston Plantation in Myrtle Beach, SC is a widely known and preferred choice of accommodations for seminars, university symposiums, business conventions, and group vacations all over the south. There is a reason for this preference, and it's easy to understand when you visit this exclusive gated resort. Developed by a group from England to resemble Winston Churchill's estate, the theme of Kingston has a British flavor. Hyde Park, Canterbury, Windsor - all are well known landmarks in Great Britain. 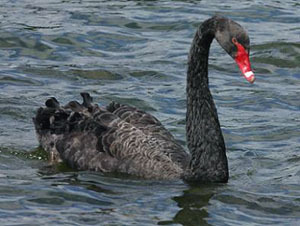 However, aside from the resident "Black Swans" that were imported from across the pond, there is no mistaking the low country tropical feel of the 145 lush acres of Kingston. The choices of available condos in the Kingston Plantation community are incredibly varied - from the oceanfront Margate Tower at Kingston to the villas and townhomes stretched across the compound. An amazing Water Park called "The Splash Pool Complex", containing waterslides, kiddie pools, and a lazy river. Oceanfront Tower Pools with Private Cabana Rentals, TV's, and Internet Access. Usage of the Pools and Amenities in the Embassy Suites Hotel and The Hilton. Elaborate Walking Trails with Wildlife Abounding. Summer Activity Programs for Children, Free of Charge. Cumberland Terrace Condos- Single level, 2 story with lofts and spiral staircases-2 bedroom units. Gloucester Terrace Condos - 2 or 3 bedroom floorplans, cathedral ceilings, sunroom, and patio. Near the Embassy Suites Hotel and its own pool. St James Park Villas - Heavily wooded 1, 2. or 3 bedroom condos set between 2 lakes on the south end of the compound. They feature outdoor storage and carports, which are a huge plus for many buyers. West Hyde Park - Truly a "park" setting with large live oak and flowering trees. The Hyde Park Villas all feature a wood-burning fireplace. 1, 2, and 3 bedroom condos are available. Richmond Park Villas- Closest to the Hilton, wrapped around Arrowhead Lake, with it's own large community pool. 1. 2, and 3 bedroom floorplans in common with West Hyde and Richmond Park. 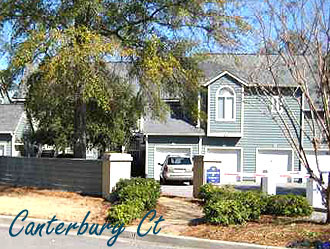 Canterbury Court Villas- Beautiful townhomes in Kingston Plantation with garages included, screen porches, jacuzzi tubs. Windsor Court Villas - Very private residential condos with single level or townhouse floorplans. Both feature large screened porches, jacuzzi tubs, and are 2 bedroom, 2 bath homes. 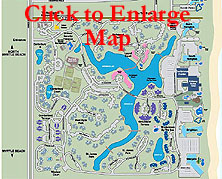 Windemere By the Sea at Kingston - Large 2 and 4 bedroom Kingston condominiums close to the Embassy Suites with jacuzzi tubs; on a lake and with a community pool. Gloucester On The Point Condos- 2 story townhomes on a single level, largest of the facilities, fantastic lake front location, and steps to the beach. 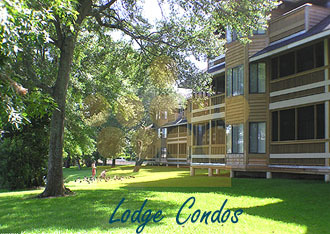 In addition, there are two "Lodge" condo facilities called Arrowhead Court and Laurel Court Lodge. These beautiful and wooded buildings are set on the shores of Lake Arrowhead.. 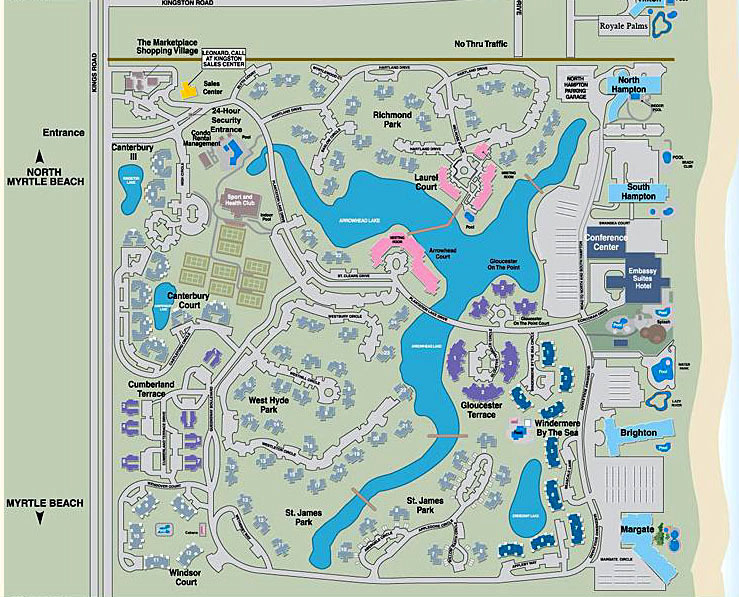 These Kingston Plantation lodges are centrally located to all the amenities as well as the convention center, and are one of the main attractions to large group meetings and conferences. Both Laurel and Arrowhead Lodge condos are a convenient walk to the Royale Palms tower, every amenity in the community, and to the Myrtle Beach Hilton. There are four main Oceanfront condo towers in Kingston Plantation's complex. These luxury beach accommodations are always popular and offer some of the best rental income Myrtle Beach has to offer. Activities and amenities in the Embassy Suites Hotel are all shared by the oceanfront towers, including the restaurants, lounges with live bands, and Starbucks. The Brighton Tower at Kingston - South of The Embassy Suites, this is a 21 story high-rise with luxury upgrades too numerous to name. Marble floors, granite countertops, open and spacious accommodations are some of what makes it stand out from the rest. Margate Tower at Kingston- a 29 story masterpiece high-rise. These huge residences are used as permanent living quarters for many of its owners...the average size being 2400-plus square feet. Every luxury you can ask for can be found here. North Hampton at Kingston and South Hampton at Kingston Condos - Two side-by-side oceanfront towers with extra large balconies. The North Hampton also offers added security intercoms, an indoor pool, and private parking deck. 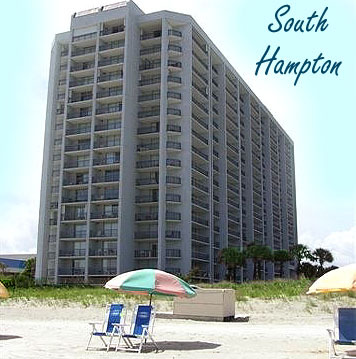 The Kingston Royale Palms Resort is another highrise oceanfront tower at Kingston Plantation, although it located right outside the compound in the new Kingston Shores, and next to the Myrtle Beach Hilton. Its shared amenities include a sandy bottom kiddie pool, 2 other pools, and a lazy river. Private cabanas can be rented as mentioned before. As you can see, this fabulous resort is unlike any other vacation and residential complex in Myrtle Beach. By choosing to invest in a vacation or real estate in Kingston Plantation, you are choosing a resort with a proven history of impressing critics, and more importantly, guests and residents. Let us take you to tour Kingston Plantation Resort for a truly unforgettable experience.